2.8L Durmax Turbo Diesel! 1 Owner! 4X4 – Power/Heated Leather-Trimmed Premium Cloth Seats – Power/Heated Mirrors – Running Boards – Spray-In Bed Liner – Rear Parking Camera – Touchscreen Radio Display – Auxiliary Stereo Input – Satellite Radio – Bluetooth For Phone – Automatic Climate Control – Leather-Wrapped Steering Wheel – Off Road Skid Plates – 17-Inch Alloy Wheels – Mud Flaps – Towing Receiver – Fog Lamps – Clean AutoCheck History Report – Visit WWW.SHERRYCHRYSLER.COM to watch a detailed 2 minute video of this car to get a first hand look before you arrive at our dealership. 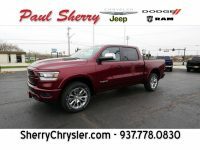 This is simply one of the many ways Paul Sherry goes beyond just giving you the best price in the Miami Valley! – **Vehicle Options listed are when the unit was originally built. Please confirm the accuracy of the included equipment by calling the dealer prior to purchase.